Hosting Kagan Is Easy as 1, 2, 3! Now more than ever you must stretch your training dollars as far as possible. On-site training saves you money. No need to wait for a Kagan workshop to come to your area. You select a site and date for your convenience. When you choose a Kagan workshop, everyone learns new skills and solutions at the same time. This means your teachers are all on the same page, building an inherent support system and fostering schoolwide engagement. 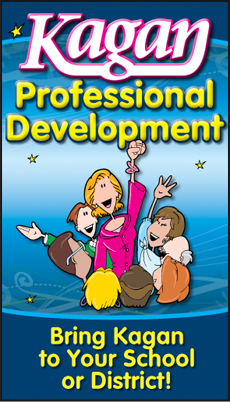 Each member of the Kagan Training Team is carefully selected, trained, evaluated, and continually updated. When Kagan sends a trainer to you, you'll be confident you're receiving the best! We guarantee results from our in-service trainings. If you don't agree that the training produced the promised positive results, we'll refund your money. Please fill out this form as completely as possible. A Kagan Representative will get back to you shortly to answer your questions and discuss Kagan's engaging professional development solutions. If you prefer, you may E-Mail or call us at 800.451.8495.